There isn’t a real culinary consensus on what makes English toffee “English.” Yes, toffee as we know it did originate in England, but by that measure, all toffee is English and the identifier means nothing. Some people theorize that it means hard toffee; others, that it has almonds in it. But there are certainly soft toffees and nut-free toffees in the U.K. as well. Perhaps most absurdly, Paula Deen has a recipe for English Toffee that uses pecans, which are about as English as a Scotch egg. The theory that makes the most sense to me–but for which I have no more support than anyone else–is that English toffee is made with brown sugar while “American” toffee is made with white sugar. The origins of toffee have to do with the 19th century use of slave labor in the West Indies lowering the prices of both sugar and treacle, a by-product of the production of syrup that is essentially a slightly lighter and less-thick molasses. The broader availability of these sugars led to the home production of sugar products, like toffee. Treacle became a popular toffee ingredient in the U.K. and still is to this day. Brown sugar is brown because of the presence of molasses. So that’s why I side with the camp that thinks brown sugar makes English toffee–the hint of molasses in the sugar emulates the treacle present in many toffees from England. And by that measure, I guess whether this is English toffee or not depends on what sugar you take off the shelf to make it. Need heavy pan and wooden spoon. Boil until golden brown, 1 – 8 minutes, stirring constantly. Pour onto greased cookie sheet. Melt 3 or 4 Hershey’s bars on top; spread. Sprinkle with nuts. 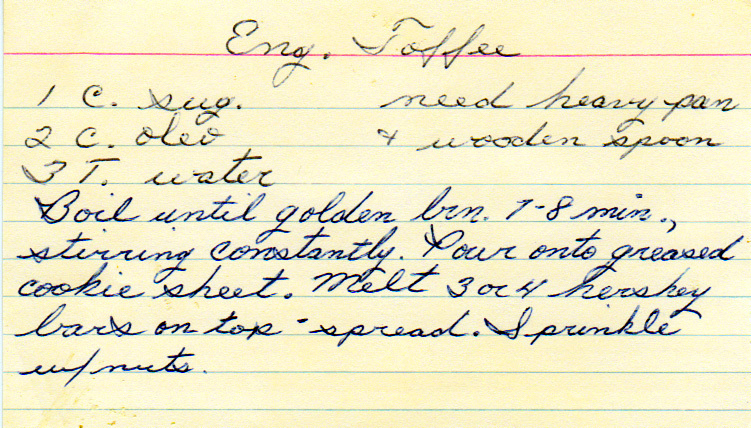 Yesterdish suggestion: Brown sugar makes English toffee, in my humble opinion. Use a candy thermometer, and instead of golden brown, boil to the hard crack stage, 310 deg. A crock pot is a bit of an odd choice for squash.